The world's longest underwater gas pipeline is currently being constructed with a view to supplying between a fifth and a quarter of the UK market. Gas supplied via the Langeled pipeline should help alleviate concerns that Britain's gas supplies might fail to meet demand during extreme cold spells or during other "unforeseen circumstances" such as a terrorist attack. The Langeled pipeline will run 1,200 kilometres along the sea bed. Such concerns were voiced by a House of Lords report out on Thursday. It said that although a disruption to the supply of gas is unlikely, if it did happen it could be widespread. The report's authors questioned "the UK gas market's ability to cover severe peak demand over the next two to three winters". "Ofgem [the government agency overseeing gas and energy markets] believe supplies are adequate except in extreme conditions. It is these extreme conditions we worry about," the report's chairman Lord Woolmer of Leeds said. The immediate challenge for the UK gas industry is to ensure there is sufficient capacity to cope with sudden spikes in demand. Though the overall challenges facing the UK are not limited to the next few winters. The UK is currently pretty much self sufficient, exporting roughly the same amount of gas as it imports, but this is about to change fast, in part due to dwindling UK North Sea reserves. Or rather, although there may still be gas to be found in the seas off Britain's coast, there is a great lack of "economically interesting" reserves. Couple this with the increasing reliance by power stations to use gas, rather than coal or nuclear power, to create electricity, and it becomes clear that the UK is about to become increasingly reliant on gas imports. "By 2010 the United Kingdom will be importing around 50% of its gas requirements. This is likely to rise to around 70% in 2020," the House of Lords report said. Furthermore, "gas prices are likely to rise significantly over this period" - in part due to an expected doubling in demand for gas from continental European countries during the next 15 years. It is likely that in a couple of years at least 20% of the gas used by the UK will be imported via the 1,200 kilometres long Langeled pipeline which is being rolled out along the seabed across the North Sea from Norway to the UK. 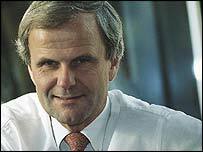 Bengt Lie Hansen: "All energy production could be a terror target." The pipeline is part of the Norwegian energy giant Norsk Hydro's £5.2bn ($9.5bn) Ormen Lange project which is due to be finished in 2007, the man in charge of the project Bengt Lie Hansen told BBC News Online. Norsk Hydro, which owns about a fifth of the project, is backed by several energy majors, including Shell, BP, ExxonMobil and Statoil, as well as by Petoro, a Norwegian state owned company. 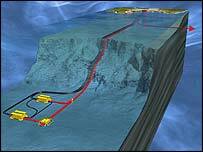 The pipeline will be used to pump 20-25 billion cubic metres of gas per year to the UK from a hi-tech underwater installation off the coast of Norway, via an onshore processing centre. Furthermore, Langeled is not only the longest submarine gas pipe built, it also has a greater capacity than any other pipeline, Mr Hansen said. To put this into context: The project is so huge it will boost Norway's total gas exports from 75 billion cubic metres per year to 100 billion cubic metres, overnight making the country the world's second largest gas exporter after Russia. And yet, even when Ormen Lange starts delivering, the UK may still be at risk of untimely power shortages. "New capacity to import is being built but even when new import schemes start operating in 2007, we still question whether a market-based 'just-in-time' system will provide insurance against the one-in-twenty year peak demand... or against unforeseen circumstances," said Lord Woolmer of Leeds. The UK is thus left with little choice: It must increase further imports of gas from Norway and Russia, as well as from the Middle East which uses ships to transport LNG. 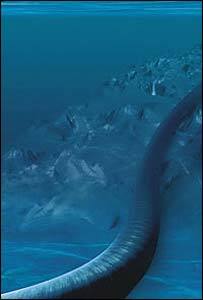 Langeled is the longest underwater gas pipeline ever built. However: "This increasing dependency on imported gas as a major energy source has raised questions about the security of gas supply," the House of Lords report said. "Clearly if there were, for example, a terrorist attack on either of the two existing terminals at St Fergus in Scotland and Bacton in Norfolk, then this could produce a national emergency for which the Government would have to assume immediate responsibility," the report said. "All energy production could be a terror target," acknowledged Mr Hansen. But adding a new gas terminal in Easington, East Riding, linked to the Langeled pipeline, would "add to the spread" of installations and thereby reduce the risk of any disruption to supplies, he insisted. Indeed, the House of Lords report said that "after 2007 a sufficient diversification of supply would in itself provide a measure of insurance to cover... shocks". Yet it did say it was "disturbed by the very low storage capacity available to the United Kingdom" and the report stressed that it would "welcome the Government's assurances" that a terror attack on gas infrastructure in the UK would not have the "dire result which, on the face of it, might appear".